This chapter explores, through the lenses of social theory, the interaction between Internet culture (the culture of openness) and the bureaucratic culture of secrecy. 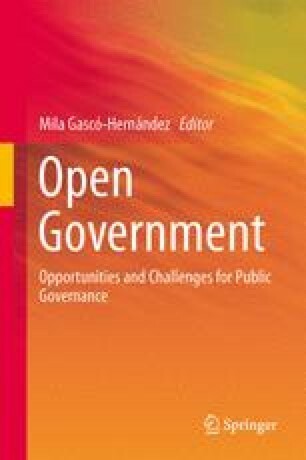 After a theoretical and conceptual discussion around the meaning of Internet culture, the chapter uses the case study of the “Open Government” policy of the Obama administration to explore its central research questions: Is the cultural code “openness/closeness” penetrating the core of the bureaucratic culture? Castells, M., & Ollé Sanz, E. (2004). E-Government in Catalonia. The Barcelona City Council in the Network Society. Research Report (Spanish, Catalan). UOC – Internet Interdisciplinary Institute: http://openaccess.uoc.edu/webapps/o2/handle/10609/272. Obama, B. (2007). Candidates at Google http://www.youtube.com/watch?v=m4yVlPqeZwo. Accessed Jan 2010. Obama, B. (2009a). Memorandum for the Heads of Executive Departments and Agencies: Freedom of Information Act. Available at http://www.whitehouse.gov/the_press_office/FreedomofInformationAct/. Accessed Jan 2010. Obama, B. (2009b). Memorandum for the Heads of Executive Departments and Agencies: Transparency and open government. Available at http://www.whitehouse.gov/OMB/memoranda/…/task_force_theft_memo.pdf. Accessed Jan 2010.